An average dry-down rate for corn in North Dakota during October is about 2.5 percent per week, so if corn reaches maturity at about 30 to 35 percent moisture on Oct. 1, it might be expected to be at least 20 to 25 percent moisture at the end of October. The average dry-down rate in November is only about 1 percent per week in North Dakota. In Minnesota, the average dry-down rate for the first half of October is generally around 2.6 percent per week and 1.2 percent per week for the last half of the month. Dry-down rates are negligible during November in Minnesota (Hicks, 2004). Normally, harvest should start by mid to late October because the amount of field drying is limited and the risk of snow and greater field losses increases when harvest is delayed. Current National Oceanic and Atmospheric Administration long-range weather forecasts are for normal or slightly below normal temperatures and normal to slightly greater precipitation during October. "Assure corn stalks and cob shanks are strong if considering leaving high-moisture corn in the field over winter," Hellevang advises. "Field losses can range from minor to severe. 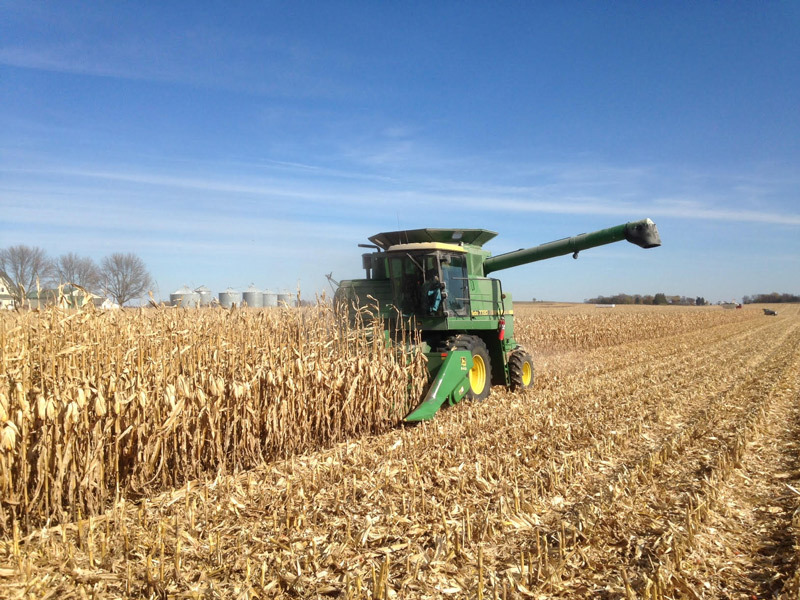 Compare the cost of drying versus losses associated with leaving the corn in the field. In addition, standing corn tends to slow soil drying in the spring, which may delay planting." To estimate the propane cost of drying per bushel per point of moisture removed, multiply the propane price per gallon by 0.02. For example, the cost to remove 10 points of moisture using $1.50 propane is 30 cents per bushel. Dividing the propane cost by the corn price provides the percentage of corn losses that will equal the drying cost (30 cents divided by $3.50 equals 9 percent). Also, verify the impact on insurance of leaving the corn in the field. With so much grain still in storage from last year, producers may be considering alternative storage options. Storage in a poly bag is a good option, but it does not prevent mold growth or insect infestations. Grain should be dry, at recommended storage moisture contents, when placed in a grain bag. Storing higher-moisture corn in a bag should be considered very short-term storage and done only at near-freezing temperatures. At moisture contents exceeding about 25 percent, ensiling may occur at temperatures above freezing and prevent the corn from being dried and sold in the general market. When storing in bags, select an elevated, well-drained location with the surface prepared to prevent the bags from being punctured, and run the bags north and south so solar heating is similar on both sides of the bags. Wildlife can puncture the bags, creating an entrance for moisture and releasing the grain smell, which attracts more wildlife. Monitor the grain temperature at several locations in the bags and repair punctured bags. "Corn above 21 percent moisture should not be dried using natural-air (NA) or low-temperature (LT) drying to minimize corn spoilage during drying," Hellevang says. "Because the drying capacity of NA and LT is extremely poor at temperatures below 35 to 40 degrees, little drying typically is possible using a natural-air system after about Nov. 1. "Adding heat does not permit drying wetter corn and only slightly increases drying speed," he adds. "The primary effect of adding heat is to reduce the final corn moisture content." When outdoor temperatures average near or below freezing, cool the corn to 20 to 25 degrees for winter storage and finish drying in April to early May. Limit the corn depth to about 20 to 22 feet to obtain an airflow rate of 1 to 1.25 cubic feet per minute per bushel, which is necessary to dry the corn before deterioration occurs. Turn fans off during extended periods of rain, snow, or fog to minimize the amount of moisture the fans pull into the bin. Using the maximum drying temperature that will not damage the corn increases the dryer capacity and reduces energy consumption of a high-temperature dryer. Removing a pound of water requires about 20 percent less energy at a drying air temperature of 200°F than at 150°F. Follow the dryer manufacturer’s recommendations, but generally, recommended temperatures when drying corn are 210 to 230°F. "Be aware that excessively high drying temperatures may result in a lower final test weight and increased breakage susceptibility," Hellevang says. "In addition, as the drying time increases, high-moisture corn becomes more susceptible to browning. A cross-flow dryer that moves corn from the inside to the outside of the drying column, varies the corn flow rate across the drying column, or varies the corn’s exposure to the drying air is more likely to maintain corn quality." More mechanical damage occurs when harvesting high-moisture corn, which affects the storage life of the corn. Dry low-test-weight corn and corn with more damaged kernels to a percentage point lower in moisture content than normal. Cooling the grain in storage to about 20 to 25 degrees for winter storage in northern corn-growing regions and near freezing in warmer regions is more important for damaged corn than for mature, sound corn. Check immature and damaged grain more frequently, and do not put immature or damaged corn in long-term storage. "Also remember that working with high-moisture corn can be hazardous," Hellevang cautions. "Become informed of the hazards and recommended safety practices. Do not become a fatality." For more information, visit the NDSU Extension Grain drying and storage website or the U of M Corn harvest website.